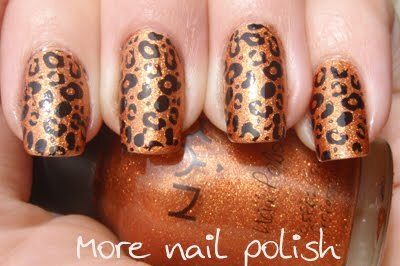 This polish is an NYX called Bronze. It was kind of 'meh' to me so I deceided to Franken it up with some more glitter. I added pale gold, yellow gold and orange glitter and also 'copper reflecks' all which I bought online from TBK trading. They have the most amazing range of glitters, micas and pigments and I have been having so much fun franking different polishes up using Ulta3s as my base. But more on them later. 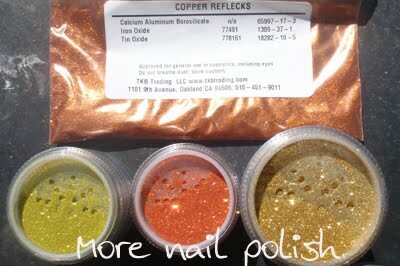 Heres a pic of the glitters and copper reflecks. The final polish was just amazing, and the above photo doesn't do it justice. There was so much glitter and bling shining through the leopard spots. 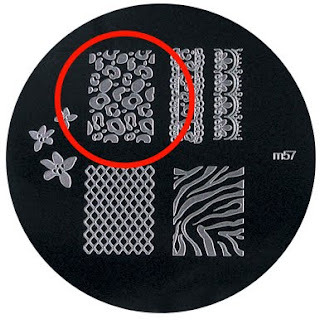 So far I've only used the leopard print from this plate. I know I will get to the zebra print soon. Not sure about the lacey lines, might be a bit to prissy for me.